I was on the Specific Carbohydrate Diet (SCD) quite a while before I tried making my own almond milk. I guess I thought it was time consuming and I was already spending so much time preparing food. Well I finally made it for the first time a few months ago and it was worth the wait. It tastes so good in smoothies, in tea or just on it’s own. If you haven’t made it before I highly recommend you try it. Everyone seems to have their own version of almond milk. I sweeten mine a little with dates but I don’t put in any vanilla extract. 1. Use blanched almonds. They are less bitter and easier to digest. 2. Soak them overnight-this makes a smoother milk and also makes the milk more nutritious as the water activates the enzymes in the almonds. 3. The more powerful your blender, the better. 4. 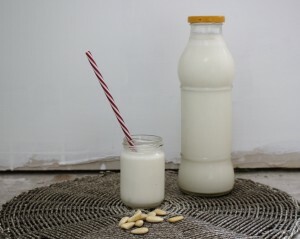 You will need a nut bag to make a smooth milk-I ordered mine from Love Tree Products in the UK. 5. This milk only keeps for two days in the fridge so only make a big batch if you will use it. 6. Place the leftover almond meal in a very cool oven for 2-3 hours to dehydrate it. It can then be used in baking. A fresh and delicious homemade dairy-alternative, great in smoothies or great on its own! Drain the soaked almonds and add to a powerful blender with the water and dates. Blend for a few minutes on high until you achieve a smooth milk.